Pop culture references abound in delightful ways. For example, when McGill’s appalling Elder Law advert screens, during a mid-morning episode of “Diagnosis: Murder,” it is followed by a pitch for the ‘Garden Weasel’, a product made notorious by Larry Sanders (with whose show Bob Odenkirk, starring here as Jimmy, was involved). When Jimmy leaves a message for Kim, trying to lure her away from her boring, sent-to-Siberia duties in document-review, and into his web of fantasy, he bizarrely sings, in a voice closer to Yoda or E.T. than Muriel Smith, “Bali h’ai” from South Pacific. 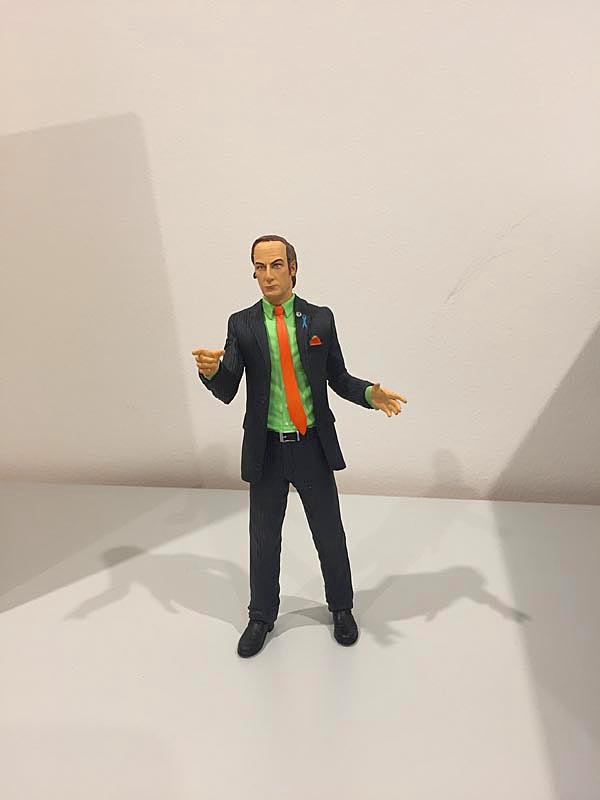 Odenkirk is a superb meld of hustler and sucker – he mostly keeps trying to live-up to brother Chuck’s impossible standards, the rest of the while breaching them. He’s Sammy Glick and yet, also, Forrest Gump. Real unethical chisellers are mostly less charming and caring in real life. The genuinely interesting characters, for us, are Kim Wexler (Rhea Seehorn), Jimmy’s conscience, his buddy, his amanuensis, his teacher, his muse, his great love, whom he corrupts, amuses and disappoints in equal measure: and Howard Hamlin (Patrick Fabian), the apparent villain of the piece, leading Poobah at law firm HHM, but actually little more than a marionette and beard for Jimmy’s brother. These guys are beautifully written and played. And then there’s Mike (Jonathan Banks), a real villain but with a heart of gold, who deals (day in, day out) with real villains, guys who are way beyond evidence-tampering and false pretences, who long ago graduated to guns, drugs and casual slaughter. Okay, great, but what about Jimmy's wig? You ain't telling me that's not a wig are you? I'm dying to see how how Jimmy gets out of admitting to sabotaging Chuck's Mesa Verde application to the banking authority. Jimmy has a real scatological imagination: 'Chicago Sunroof'? 'Squat Cobbler'?